Recently, regulatory authorities have increased enforcement of the Environmental Protection Agency’s 316(b) regulations, which regulates facilities that withdraw at least 2 million gallons per day from waters of the U.S. The law aims to reduce the environmental impact of natural cooling water use on the ecosystem by reducing fish and larvae entrainment and impingement. The EPA expects that these regulations will affect more than one thousand electric power plants, pulp and paper mills, chemical plants, iron / steel / aluminum manufacturing, petroleum refineries, and food processing plants across the country. 316(b) can impose engineering challenges for system operators. Makai Ocean Engineering has completed the final design of an intake retrofit for one of the 316(b) affected power plants, owned by the Cayuga Operating Company, in Upstate New York and drawing water from Cayuga Lake. This facility required a new array of screen assemblies totaling several thousand square feet of screen area and weighing more than 50 tons. 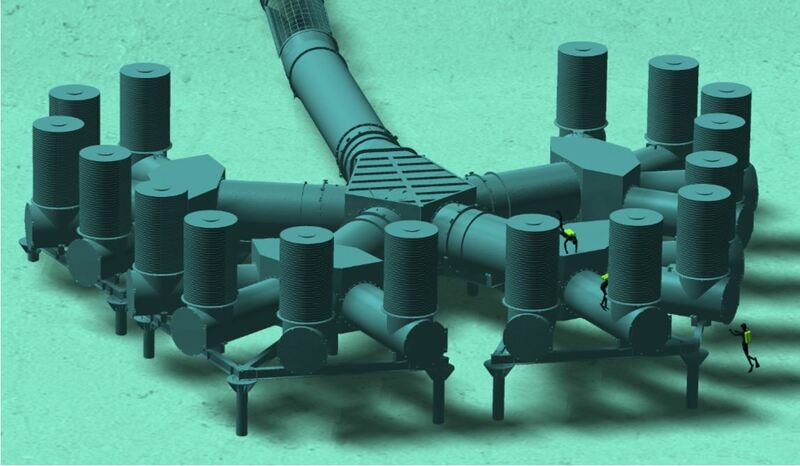 In designing this cooling water system, Makai applied our multi-disciplinary mechanical and marine engineering and construction expertise, along with state-of-the-art computational fluid dynamics, 3D structural design, and finite-element analysis techniques. The final design is both hydraulically and structurally efficient, but is also cost-effective and designed to be easily constructed and installed by marine contractors. As of January 2017, we are proud to announce the successful installation of the power plant cooling water system. Since final installation and commissioning in January, the system is now fully operational and supplying water to the power plant! The Cayuga Operating Company is one of the nation’s first large utility plants to go through the EPA Clean Water Act, Section 316(b) process in its entirety. Screens were fine slot (30 thousandth of an inch / 0.75 mm) mechanically cleaned cylindrical wedge-wire screens supplied by Intake Screens Incorporated (ISI), with whom Makai worked closely on the project. Makai used an integrated design approach to this system, optimizing the structure through a continuous iteration of CFD (computational fluid dynamics), FEA (finite element analysis), and value engineering on the structural arrangement for constructability, fabrication, and shipping. The above design actually inspired this year’s comical Makai Holiday Card! If you haven’t seen the short movie yet, we think it’s worth a laugh or two. Makai worked closely with Intake Screens Inc. and other subcontractors on the project. Our team delivered a custom solution for the client that meets their strict hydraulic limitations, their budget, as well as the stringent EPA 316b guidelines that will help to preserve the marine ecosystem. With such careful designs, planning, and close coordination with the marine contractors and screen fabricators, the installation and commissioning went smoothly and without a hitch! Read more: See the Intake Screens Inc. website for more details and pictures.